#6-21 Mission style ball rack of modest size. 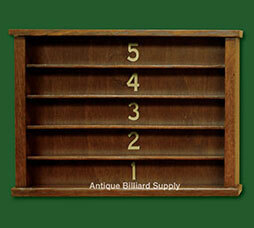 The perfect companion for a variety of antique Brunswick pool tables from the early 1900s. Quarter sawn oak construction, 20 inches wide, 15 inches tall. Five shelves to display old pool balls or other memorabilia.